Deadpool game has got new character! Recently we have informed you that upcoming Deadpool game has got a widely-known character - Wolverine, and today we want to tell you about a new hero that will appear in this action. 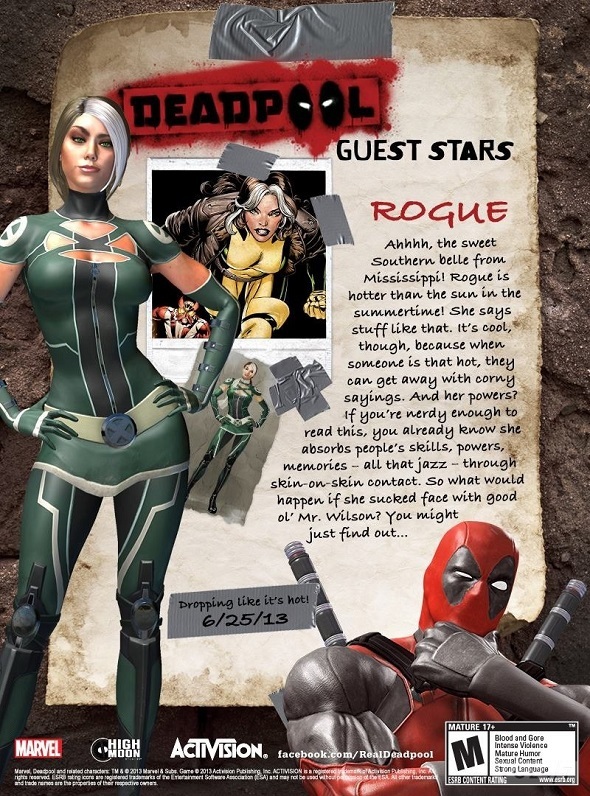 Yesterday, Activision announced officially that Deadpool game (in addition to the newly added Psylocke, Domino and Cable) will get another one well-known (thanks to "X-Men") character - Rogue. If someone has suddenly forgotten, we would like to remind that Rogue is a character, which ability is taking away the mutants’ superpowers (temporarily) when she touches them. So Deadpool game promises to be very interesting as our heroes, for sure, now will have to invent the ways to win the battles without their superpowers. And the best part is that anyone who wants to play this action very much, does not have to wait for a long time because Deadpool release date is June 25, 2013. It will be released for PC, Xbox 360 and PlayStation 3. Deadpool launch trailer is released!